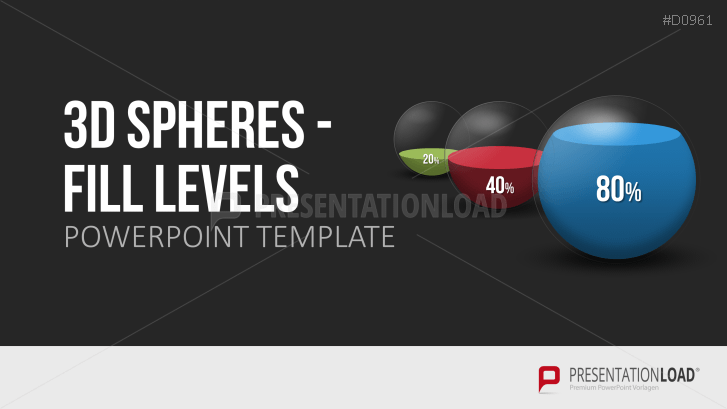 Illustrations of spheres with various fill levels to display allocations in PowerPoint. With the 3D Spheres - Fill Levels templates, you can convey your values through different fill levels in 3D spheres as well as show those spheres arranged in different figures such as a stepladder or weighting development. With sphere diagrams, percentages and distributions can be displayed graphically. The highlighted levels in the spheres represent the percent values. For example, at 5 percent, only a small part of the sphere is filled, whereas at 100 percent, the complete sphere is full. Spheres with fill levels are suitable for companies to display and compare the weightings of work or cost factors. Positive and negative developments can also be conveyed through the various levels of ordered spheres. For business presentations, this quick illustrative overview of trends and percentage distributions is a way to draw the audience in. The collection includes numerous variations of 3D spheres, whose levels are adaptable to your values and can be highlighted with color. In slides with multiple 3D spheres, you can visualize percentage developments in your company and submit a description of your weightings in the standard text placeholder.